Many people will debate if computers have made our lives easier. There are fewer and fewer people who can honestly say that their life is "computer-free." I know that I could be categorized somewhere between a "power user" and a "geek.�h But I have found that computers have certainly had an impact on diving. When visiting your favorite dive store, or Internet site, you will find there are two distinct types of dive computers; wrist or and console mounted. I like the wrist-mounted computers over the consoles but that is only a personal choice. Wrist mounted computers include Oceanic XTC and DataTrans models and Suunto Mosquito and Stinger models that all seem to be leading a very competitive field. Why? Because they meet a diver's needs, they are not big, and they can give the needed information during and after the dive without requiring a college degree. Plus they can replace the bulky console that hangs off the regulator. 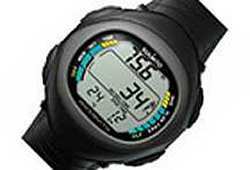 Older divers enjoy the size of the digital display as they can actually read it underwater – and that’s important! Each of these computers can also compute NITROX tables should you choose to increase your No Decompression Limits using Enriched Air that is now in abundant supply on Okinawa. Suunto's Mosquito and Stinger models also double as wristwatches as well. What to look for in your computer? As you can see I think you should be most concerned about the size of the digital readout and the type of algorithm the computer uses. Simply put you want a computer that is conservative in managing your bottom time and regulates your ascent time with some discipline. The best computers will actually allow you to observe your ascent rate on a display scale, and, in my opinion, this is important feedback. Another feature you may hear about is having a computer that is "Air Integrated." This means that the computer also monitors your air pressure as well. It integrates your available air supply with every breath, calculates your air consumption, and then compares that with the amount of nitrogen uptake you are experiencing. It then reports how long you can safely remain at that depth. This is a really nice feature, and with the Data Trans Plus or the Alladin Computers you end up with what is similar to a dashboard of information on your wrist. This electronic link is the "hoseless" feature you may have heard about that allows a diver to be much more streamlined. I like this feature since it is one less hose to maintain and to flop around underwater (which should not happen anyway). So what could be the draw-backs to augmenting your diving with a new dive computer? A real problem that all instructors worry about is that divers will forget how to calculate their dives using their certification agency's tables. This is really a problem for divers that have just been certified and begin diving with computers right away. They may lose their understanding of pressure, nitrogen uptake, and decompression theory. Our second concern is when a dependence on computers is established the diver forgets to service the batteries regularly, and embark on a dive with a dead battery. This coupled with forgetting how to use Dive Tables can lead to a seriously dangerous condition. You will find that each dive shop on the island carries, or can order, the computer you choose. Computers are tools and I hope I have opened up the varied world of dive computers to you. Since Christmas is coming I am sure that if you do not have one you may be thinking about putting one on your wish list for Santa Claus this year. Click over to http://www.scubatoys.com and you will get a really good rundown on most of the computers I have presented as well as many more to choose from or better yet visit your favorite dive shop before making your Christmas list complete. Ask lots of questions when you are out diving and find out what the Instructors are using and WHY. I know that I like the use of computers and what they have done for my diving but I have not forgotten where I came from and have tried to keep my Dive Table skills sharp. See you at the beach. I am the bald guy checking his batteries! Fish Pic of the week is the Oriental Butterflyfish (Chaetodon Auripes) which graces the reefs around Okinawa with its simple beauty. Often confused, by me at least, with the Racoon Butterflyfish because of the black stripe that crosses their eyes. This stripe is nature’s way of camouflaging the fish’s eye from predators who can inflict damage during a conflict. 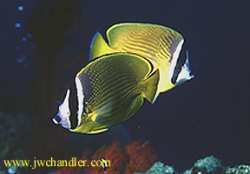 Next time you are snorkeling or diving keep a lookout for the Oriental Butterflyfish. The more you know, the more you enjoy our reefs!